To kick off, I have two vintage pressings for you to compare. One an original Prestige, the other, one of my native Esquire pressings, from US metalwork. Except there are a few twists along the way. Sonny Stitt on tenor, sounding Rollinesque before Rollins, extraordinary agile mastery of whatever the bits of the saxophone are called where the valves are – big toned headline statements followed by breakneck speed in the changes, while Powell shows the keys no mercy, you are bouncing along with Bud at the height of his powers. Both Prestige and Esquire originate from the same master – a re-master by Van Gelder from whatever was used to record the sessions in 1949 and 50 – But it looks like some intermediate metalwork from different pressing plant, on Abbey Manufacturing (AB) the other not. Ripped under identical conditions, they sound “different” but which has the edge? Do either? Or is it too close to call? 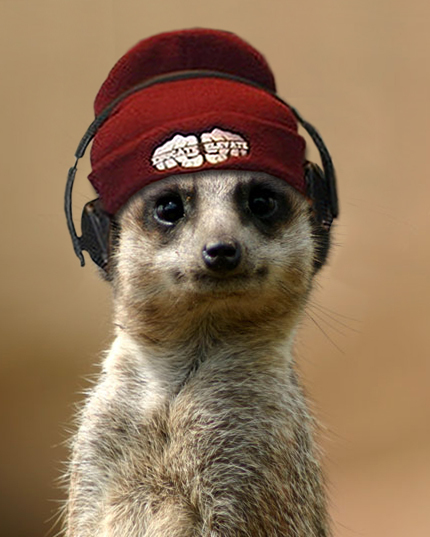 I turn to new LJC guest mixmeister MC Kool-Kat, taking over the cans from Dimitri-Shostakovich – who we had to let go due to a growing obsession with car insurance. Whadyathink, Kool-Kat? Great to be here, LJC. Been big fan long time. You want I save you on car insurance? Only kiddin’. But first, LJC, you boss, what’s you thinkin’? LJC: it’s a close run thing but I think the original Prestige NYC press has the edge. Not by much, it’s a little fuller, the instrument balance better, and Stitt’s tone comes across a little more fruity and lively. I had to switch backwards and forwards quite a few times before I settled. I’d be happy with either, but I like the Prestige cover a lot more. And you? Yeah, me too, I agree, you nailed it boss, no contest, the Esquire walked it …umm.. or may be it was the Prestige, I’m new at this pressing comparison stuff. That Sonny Rollins is great isn’t he? Really keeps it swinging. Bebopalulah. Modal. Like my beanie? It’s Primark. A lot us DJs get our gear from Primark. Price pretty good compared with Topshop. Cheaper than George at Asda, and save big money on Next. Esquire’s economical graphical style pitted against Prestige’s disturbing Adams Family birds in flight from graphic designer Don Martin, who was responsible for several similarly quirky Prestige designs in the early 7000 series. add their own local reference codes. From that North London record store collection purchase. Even though I already had the Esquire of Stitt Powell Johnson, an original Prestige Fireworks NYC was too much to resist. As owner of around forty of fifty Esquire Prestige releases it is reassuring that the difference between the two sonically is close. Especially at the price premium commanded by NYC originals. As for that metalwork, once again, just when you think you have something all figured out, something like this comes along and reminds you, you don’t know it all. Rumsfeld moment, you don’t even know what the proportion you know is of what there is to know. 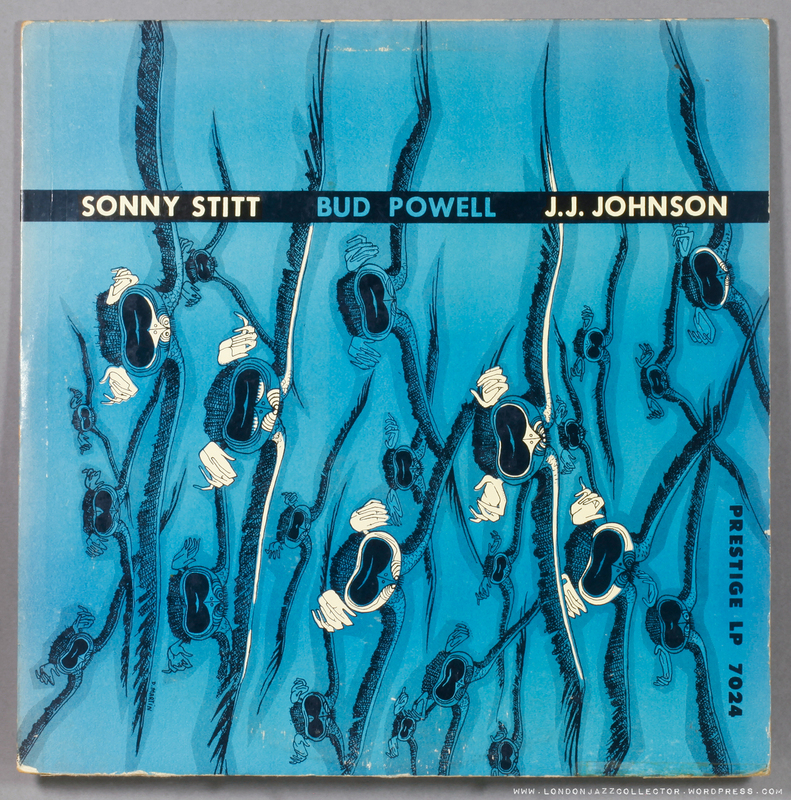 This entry was posted in Bud Powell, Esquire, J J Johnson, Prestige, Sonny Stitt and tagged Bud Powell, Curly Russell, Esquire, J.J. Johnson, John Lewis, Max Roach, Nelson Boyd, Prestige, Sonny Stitt by LondonJazzCollector. Bookmark the permalink. Since the originals for the Stitt/Powell recordings were cut for 78 issue, i imagine they were mastered on lacquers, then remastered for issuance on 10-inch LP, and then again for issuance on 12-inch LP. First, I bought the 10-inch LP. Loved the music, but not the pressing, so I started to collect the original 78s, which did have better sound. Years later, I got the 12-inch LP, which had better sound still. I was amused by Adrian Cullen’s comment on (experienced) 78 collectors. Totally correct! A 78 collector whose collection encompasses recordings from 1917 to the mid-1950s has dealt with far more details and formats than collectors of expensive 12-inch LPs from the 1950s to early 1960s. Hi, Just to add to the general confusion about Esquire releases. I have a tape recorded interview with Peter Newbrook, co-owner & in the early days recording engineer of Esquire, made shortly before his death in 2009 and he states that Neither Decca or EMI undertook any third party pressings for the small independent labels of the 1950’s/60’s. The big 4 record manufacturers in the UK at that time (Decca, EMI, Pye & Philips) really had the UK market sewn up and used to pressurize some shops that also sold their equipment, such as record players/radios/TV’s/Tape Recorders not to stock independent releases. He also mentioned that Linguaphone the company that produced language tuition records did often press Esquires at their plant at Slough. But a bit more spade work may be needed here to unearth more info. No idea what the extra info on the metalwork for your S.P.J. refers to but both rips sound great on my (modest) equipment. Decca is innocent, of that I am now fairly certain. I usually hesitate to rely on any information from Discogs, but in this case I think it can shed light on the origin of the two numbers in the runout. As for the absence of the ‘AB’ mark on the Esquire pressing: it seems to me this indicates that the two records were pressed from different mothers. Remember, since the ‘AB’ mark is recessed, it would have to either be present on either the lacquer or the mother. Since we know that the etched RVG was present on the lacquer and is it’s common to both pressings, that leaves the mother. The CA mark seems to have been introduced along with the Pathé Marconi numbers. My guess is the mark of the organization that handled the plating (like the ‘LW’ for Long Wear Plating often seen on Impulse! pressings). If Abbey didn’t plate the mothers used for overseas production, who did? Was the matrix shipped overseas to be plated elsewhere? Again, I hope someone who understands the record manufacturing process better can offer some potential scenarios. Why are there both Barclay and Pathé Marconi catalog numbers? This is especially odd given that Esquire pressings typically have the same marks as their Prestige counterparts. Despite the French markings in the runout, I feel like we still don’t really know where the Esquire LP was pressed (I’ll save that comment for LJC’s new page here: https://londonjazzcollector.wordpress.com/record-labels-guide/10-esquire-uk-2/whe-pressed-esquire/). With regards to the sonic differences between the two pressings, my personal take is that they are mostly the result of the decades worth of wear and tear on each of the respective pressings. Like many of us, I have listened to many kinds of distortion introduced to many different varieties of vinyl by many different record players. In my opinion that is mostly what accounts for the differences heard hear. Finally, I have always been fascinated by the bizarre cover of “Miles Davis and Horns”. It somehow manages to be creepy and whimsical at the same time while simultaneously having nothing whatsoever to do with either Miles Davis or Horns. I immediately recognized the covers of “The Brothers” and “Trombones by Three” as being the product of the same deranged mind. I was truly thrilled when I discovered that the artist behind them was someone I already and knew and loved from my childhood love affair with MAD magazine: Don Martin. Ah another disciple of Alfred E Neuman. Brilliant, in its day, has probably left a good number of minds permanently unhinged. Perfect reasoning, as always, Felix. Barclay origin for certain – they were the Prestige licensee for France, though I have never seen one personally , perhaps Rudolf has one. I have seen Artone Prestige, Metronome Prestige and Saba Prestige and they are all same as Esquire – US metalwork plain and simple. The overprinting with local codes is something I can’t explain but must have something to do with the Pathe Marconi connection. Who pressed for Barclay? Mon dieu, enough questions for one day. The SPJ, which we know was the second pressing, was pressed in France or pressed in UK with the French mother/stamper/whatever, I don’t understand the process well. Perhaps the UK stampers had gotten lost or damaged and they borrowed metal from fellow Prestige licensee Barclay in France, that had been duplicated for them by Pathe Marconi. I have only two Prestige/Barclay. 84.060 “Ténors Modernes – the Sonny Rollins Quartet” = Tenor Madness. Awful art work. Classic grey Barclay labels. Now for the deadwax: has RVG 7047 and AB. On top of that: XBARCX 39044 AND M6-190056. 84.080 “Thelonious Monk rencontre Sonny Rollins” = equals 7075/7169. Labels are the later yellow/brownish ones, as for Jacques Brel’s albums. Nice cover, showing photos de l’époque of Thelonious and Sonny, made by Herman Leonard (one cannot go wrong with Leonard). Now, surprise: the only marks in the dead wax are BLY84080 either side. That’s all. I wonder whether my learned colleagues can make any sensible conclusions. 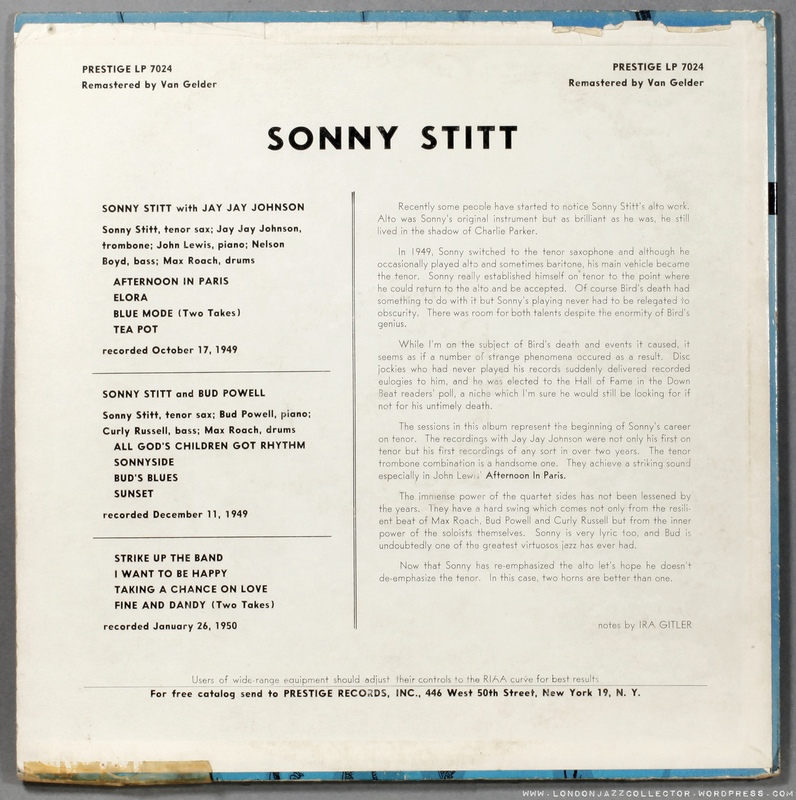 I don’t know if this is helpful or more confusing but Esquire first issued 8 of the Sonny Stitt titles (sans one take of Fine & Dandy) here in the UK on a 10” LP in August 1953. Cat No.20-013. Haven’t got the disc just the info from an old catalogue. Maybe this would explain some further dead wax info on your 12” issue, just a thought anyway. My 7024 is identical to yours, but the front is pasted otherwise (musicians’ names horizontally and catalogue number vertically bottom right). Engravings in dead wax as yours. Now for theEsquire: dead wax side A: AB and immediately thereunder II (like roman ones or capital i. Side B: AB and a small B elsewhere. No other signs, unlike yours. I have not playgraded and compared the audio. The Stitt quartet session is essential. Sonny never played better and he is to be preferred on the bigger horn. Looked at your S.P.J. picture of your 3/5/12 post: yours looks like a second pressing: no text on the round spine and no price under the catalogue number. I reckon that your copy is not laminated on the rear, with the exception of the flip over rests..
(Sadly) you are correct – looks like a second issue. Diligent of you to spot it. I wonder if the duplication task for a second pressing by Esquire explains the job codes added to the metalware. It doesn’t look like the handiwork of Decca, who worked Invisibly. Perhaps Carlo Kramer broke with his usual business arrangements and sent the job to a third party to press the second issue. I haven’t seen these codes on other second issues. Another of the mysteries of vinyl production in the Fifties and early Sixties. Why would this surprise you, Andy? London (US) and Decca (UK) and their numerous – legitimate and otherwise – affiliates and subsidiaries were incestuous and promiscuous Siamese twins misconceived in the same metal mother’s womb and conjoined at their cutting lathe heads (actually:only one corporate head, presumably the one in New York) and mutual pressing outsourcing (as well as outsourcing to the third parties, every bit as incestuous), plus importing, exporting and re-exporting and re-labeling of each other’s titles for the local markets (and for the purpose of some funky tax business and creative accounting) was a rule rather than exception. It still is, by the way, The times they are not-a-changing. Although I was unaware of any such arrangements between Prestige (US) and Decca (UK), this should not be seen as a shocking development. I definitely would not lose any sleep over additional metal markings. If you do, you will end up in the rubber room before you can say “I collect Barbies and Kens” and the Department of Health will then have to send people in white carrying fancy back-buttoned jackets to come and take you to a very beautiful and serene place (on the upside, you could start working for NYPD right away) . My qualified guess is that Decca simply used one of it’s more obscure and underused UK pressing facilities or affiliates for this job. But – hey – what do I know?. I am on this bizarre cluster of galaxies only in passing. To my ears the Prestige original sounds(as usual) more crisp,whilst the Esquire sounds a bit warmer.I prefer the original,wich I don’t have.I do have a later reissue(Prestige 7248),mono,blue label.PS.I like the Esquire cover! The 7248 (“All God’s Children Got Rhythm”) was originally pressed on the Yellow NJ labels. The cover is not attractive, but I see it around a fair bit, and it’s usually very cheap. A good choice for the budget-conscious among us for this terrific album. By the way, 7248 (on the yellow Bergenfield label, anyway) features the same stampers as the original: PRLP-7024-A RVGh AB. So a good deal if found. I only have a late German re-issue of this date, but it is a super record. Thanks for bringing my attention to it so I can grab it for another listen. Early Prestige sessions such as these are no sonic masterpieces even if you have access to originals ( 78s). 78 shellac from Prestige or Esquire will however surpass vinyl editions in my experience. Collecting 78s is of course a whole other world. 78 collectors make Blue Note etc. collectors seem like dilettantes. I’d have to second the sonic masterpiece comment. I just chanced upon Miles Davis With Horns – which ironically is pictured above – which contains sessions from 53 followed by stuff from 51. The difference is quality is stunning…then compare it to your post 55/56 Miles’ Prestiges and it’s crazy different.